and applying visualization tools to communicate with project managers, policy-makers, scientists and the public. Mastering these challenges requires Spatial Data Science: big data tools, geospatial analytics, and visualization. Today’s marketplace needs trained analysts who know how to find, evaluate, manage, analyze and publish spatial data in a variety of environments. With this hands-on Spatial Data Science Bootcamp for professionals, you can expand your GIS skill level and learn how to integrate open source and web-based solutions into your GIS toolkit by gaining an understanding of spatial data science techniques. The goal of this Spatial Data Science Bootcamp is to familiarize participants with the modern spatial data workflow and explore open source and cloud/web based options for spatial data management, analysis, visualization and publication. We’ll use hands-on exercises that leverage open source and cloud/web based technologies for a variety of spatial data applications. The Geospatial Innovation Facility is excited to announce that we will be offering our standard workshops series for FREE this spring to UC Berkeley students, faculty, and staff. Currently we still need to retain our pricing of $224 for all non-UC affiliates. However, space is limited and the workshops will be filled on a first-come first-served basis, so register today at to take advantage of these great training opportunities! GIF workshops offer hands-on applications oriented training in a variety of geospatial topics. Our Introduction to Geographic Information Systems (GIS) and Introduction to Remote Sensing workshops are designed for participants with little to no experience in GIS, or those who would like to refresh their geospatial skills. 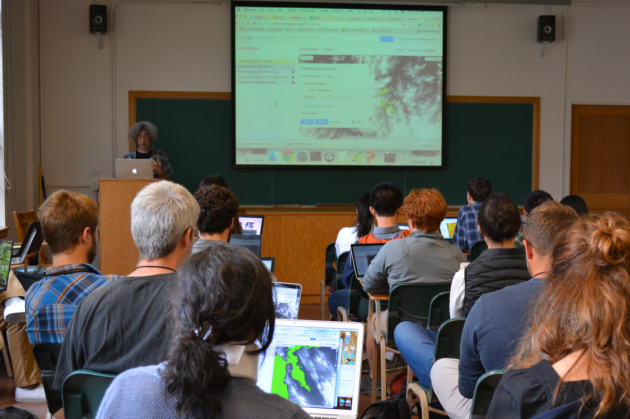 Each workshop teaches core geospatial principals and techniques through a combination of lecture and hands-on interactive activities. The presentation will get you up to speed on what kind of analyses GIS may be used for, as well as the basic structures of spatial data. After the lecture you will follow an interactive exercise that has been designed to introduce you to ArcGIS Desktop software while analyzing street and census data around the City of Berkeley. The presentation will get you up to speed on what kind of analyses GIS may be used for, as well as the basic structures of spatial data. After the lecture you will follow an interactive exercise that has been designed to introduce you to ArcGIS Desktop software while analyzing environmental data from around Lake Tahoe. QGIS is a free and open source geospatial desktop application that has been developing at a rapid pace. Its ease of use and accessibility (available for PC, Mac, and Linux platforms) has created a strong and active user community. In this workshop, we will explore the basic functionality of QGIS so that you may quickly learn how to load and format vector and raster data, edit shapefiles, and query attributes. An introductory presentation will get you up to speed on what kind of analyses GIS may be used for, as well as the basic structures of spatial data. After this brief lecture you will follow an interactive exercise that will introduce you to using free and open source online data to analyze and map rangelands in the California Central Valley. This workshop introduces basic principles of understanding digital imagery, both satellite and aerial. Through a combination of lecture and interactive activities, we will explore what makes up a multi-spectral image, where to find and download them, and how to view and manipulate imagery. These workshops are held in 124 Mulford Hall and run from 1pm – 4:30pm. Sign-up now for this great opportunity for intensive, hands-on training in geospatial methods, tools, and analysis! This new workshop is designed for participants who are already familiar with GIS and spatial analysis concepts who are interested in using R. The presentation will introduce attendees to major spatial packages and concepts within the R environment. We will step through hands-on exercises exploring tools and methods for analyzing environmental data within R, and supply information for participants to continue their exploration of these methods in their own research projects. This workshop is designed for participants with little to no GPS, GIS or web mapping experience. The workshop will include an interactive exercise that will have you building your own mobile data collection survey to be used with your Smartphone GPS. You will then see how this survey application seamlessly integrates with ArcGIS Online to create a web map that displays the survey results in real time.This course content is the result of a collaborative effort between UC ANR IGIS Statewide Program, and the UC Berkeley, Geospatial Innovation Facility (GIF). Register for these new training opportunities today! Space will fill up quickly, so make sure you register soon if you are interested. Also, feel free to pass this email onto your colleagues who may also be interested. If you have any questions, contact Nancy Thomas at nethomas@berkeley.edu. Please join us for GIS Day 2015! You are all welcome to visit us at the Geospatial Innovation Facility for this year’s GIS Day Celebration on Wednesday, November 18th. This year’s event is co-hosted by the GIF and BayGeo (formerly the Bay Area Automated Mapping Association, or BAAMA). Not only are we celebrating all things geospatial for GIS Day, we are also celebrating the GIF’s 10th year anniversary! The GIF was formally started at a GIS Day event in 2005. As in previous years, we will be having a poster session, many exciting talks, and refreshments. It is a great time to network and catch up with what is going on with mapping around the SF Bay Area. Instead of a Keynote talk, this year we will be holding a Plenary Session in the early evening with local innovators from Bay Area Industry, Government and Non-Profits (including Stamen, PlanetLabs, Google, 3DRobotics, GeoWing, iNaturalist, and NASA) who all focus on state-of-the-art geospatial technology and solutions. The discussion will cover such topics as what skills they look for in recruiting, where they see the geospatial world going in the next 5 years, and how we can better partner around the bay to stay at the forefront of the geospatial revolution. 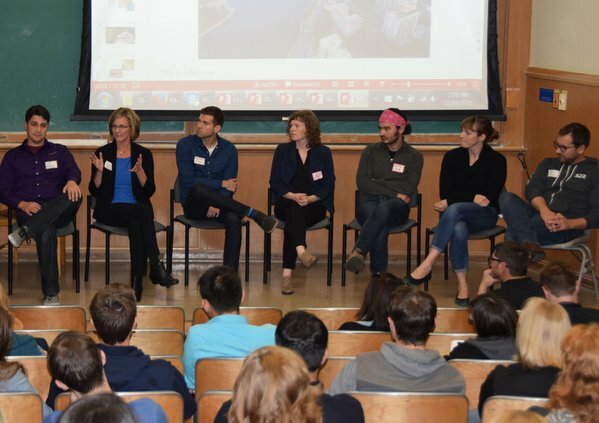 We also had a stellar panel of UC Berkeley professor Jeff Chambers and graduate students Sophie Taddeo, Alexander Bryk, and Lisa Kelley who shared an intimate view of how they were using Earth Engine in their research. The panel shared stories of using Earth Engine to evaluate disturbance in tropical forests, map the movement of wetlands, and meandering rivers, as well as looking at agroforestry systems in Indonesia through a socio-ecological lens. Thanks to Google and the Earth Engine Team for guiding, the GIF for hosting, and all of the participants for engaging in an action packed two days!